Homemade Face Masks - Homeopathy and Beauty. 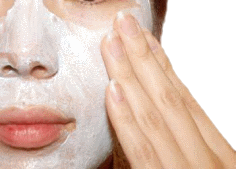 Opt for homemade face masks, why get involved in the expense of a facelift? If you're looking for a little skin help, look no further than the beauty salon in your kitchen! Homemade face masks are a fun and cheap way to relax and feed your skin. During a face-lift, you get given a younger face by the surgeon, but it is a very costly process. One can obtain the similar benefit of a finer textured skin and better skin tone with natural face masks. The best inexpensive, accessible, time saver and friendly beauty salon lies in your kitchen using natural ingredients. Using these natural ingredients in homemade face masks provide natural oil and moisture to the skin. One of the best and simplest moisterising homemade face masks is honey. Use warm cloth to open pores, smear on honey, leave on 15 to 30 minutes, rinse off with warm water, and then use cold water to close pores. Use for 3 days in a row and then once a week. You will be surprised at the level of improvement of your skin. The best advantage of opting for natural homemade face masks is that you can always be sure to find one that will suit your skin type. Honey, Egg and Milk Mask - to tone and tighten your skin. Beat together 1 egg, 1 tablespoon milk and 1 tablespoon honey. Apply to the face and neck. Leave to harden. Remove with tepid water. The above mask can be varied slightly to give the skin a natural healthy glow by excluding the egg and increasing the milk and honey to 2 tablespoons each. Leave on for 10 minutes and rise off with tepid water. Egg Mask - A wonderful mask to deeply cleanse away facial dirt. It does tend to pull, so be prepared for this; the after effects are a smooth, refreshed and cleansed complexion. The original recipe calls for this every day although once or twice a week is quite sufficient for such a deep cleanse. Use organic eggs. Separate the yolk from the white. Beat the yolk and place on a cleansed face and neck for 10 minutes. Rinse with tepid water. Then whisk the white and apply to the same area for 10 minutes, rinsing off with tepid water. Immediately apply moisturiser. Tomato Pulp Mask - Tightens up your skin, and closes the pores. When you make the tomato pulp mask squash some tomatoes, drink up the juice and extend the pulp all over your face. The tomato juice is for refining your skin from inside. Banana Mask - Moisturising your skin. To make a banana mask, squash 1/4 banana until very creamy, apply to face and leave for 15-20 minutes. Rinse with lukewarm water, and then use cold water to close the pores. Vinegar Mask - Vinegar renovates the acid balance of skin and also acts as a mild exfoliant. Try adding 1 cup of raw apple cider vinegar to a warm bath to ease the separation of peeling skin. Oatmeal and honey One of my favorite homemade face masks. Mix to a soft spread and apply to the face for 15 minutes. Use once a month as a deep cleansing mask. Oatmeal and cucumber Grate enough cucumber juice to mix into a soft paste and apply to the face, hands or feet for 15 minutes for a refreshing and cleansing mask. Carrots and turnips Cook and mash. Spread onto face and leave for 1hour. Cleanses and refines the skin. Cucumber juice Grate and collect juice. Add to cool water and wash your face for an instant cooling and refreshing sensation. Cucumbers Cut a small cucumber into pieces. Soak for 5 hours in milk. Gently apply mixture to burn area. Egg white Lightly whisk and apply to the face to cleanse and close large pores. Buttermilk Astringent, helping to reduce large pores. Apply to the face and leave for 10 minutes. Rinse with tepid water. Honey and egg Mix 1 spoon honey and 1 beaten egg white. Spread over the face and leave for 15 minutes. Rinse with tepid water. Refines the older skin type. Lettuce juice Scald lettuce in a little boiling water. Squeeze out the juice. Apply to pimples and rough skin. Last but not least make sure you include this mask from screen siren Marlene Dietrich's "kitchen beauty salon"... as one of your homemade face masks. Beauty Mask a la Marlene Dietrich - 1 egg yolk, 1 teaspoon honey, 1 teaspoon sweet cream, 1 splash lemon juice. Mix all the ingredients very well and put it on the face, wash it off after 20 minutes, rinse with cool water.